This double-edged beauty’s precision head helps you attain the perfect shave. Shaving is serious. Your razor should be, too. With that axiom in mind, we introduce this double-edged beauty, whose precision head helps you attain the perfect shave. It's a favorite among wet shavers. 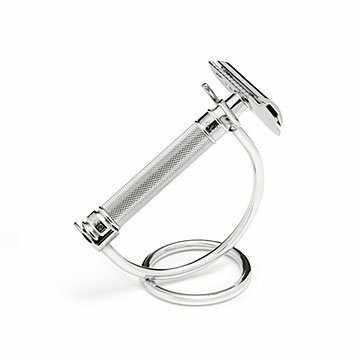 An easy-grip handle and chrome-plated stand complete the package, so you've got somewhere suitable to stash your new favorite hair-trimming thing. Comes with a double-edged safety razor blade. Made in Sheffield, England. Gift Box: 5.5" x 5.2" x 4"